Traditional & Roller Sissy Bar Bags. Saddlemen makes many different types of sissy bar bags for you to choose from. The Traditional section features our Deluxe sissy bar bags, economical Universal bags, and Express Desperado, Drifter and Cruis'n bags. The Roller section features bags with smooth rolling wheels and a retractable handle. Sissy Bar or Seat mounted bags. Check out the best selling BR1800 & BR3400 and more! 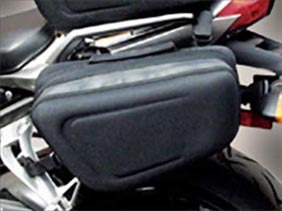 Seat Bag Combos allow you two simple and fast mounting options to allow you to easily mount your bag to your sissy bar, motorcycle seat, or luggage rack. Choose from BR Series or Fastback Series. 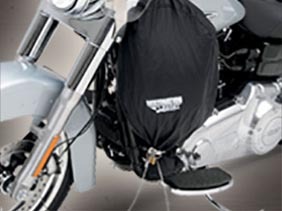 Easy to install, includes a rain cover, and is expandable to hold all of your motorcycle gear. Rugged enough for motorcycle touring, but looks great on any motorcycle or sport bike. 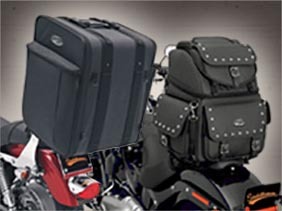 An outstanding group of soft luggage for your motorcycle. No Rack Required! Bags that mount directly to your seat or tail section. Saddlemen's motorcycle seat and tail bags and Sport Tunnel Bags are designed for every type of riding and every style of motorcycle. 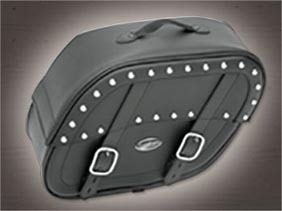 Saddlemen's saddlebag covers protect your bagger's saddlebag lids. The soft backside is gentle to your paint and matches most seats to look great and protect your bike. 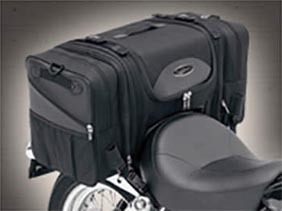 Also available is a Tour Pack trunk cover for Harley touring motorcycles. Versatile Tank Mounted accessory bags multiple styles. 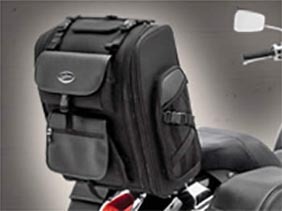 Saddlemen's Tank Bags offer convenient storage for all kinds of travel. These bags are easy to install and remove, and are perfect for the many small items riders want to have instant access to. Cell phones, MP3 players and digital cameras. Alone or as part of a luggage system - Saddlemen roll bags are both stylish and versitle. Versatile mounting system allows bags to be installed on luggage rack, back seat or sissy bar; clips onto most Saddlemen touring bags. Find the right Saddlebag here! Many designs and matching pieces to choose from. 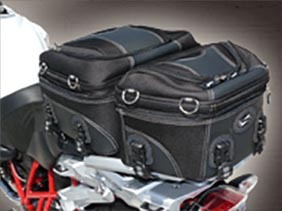 Saddlemen's saddlebags are coordinated sets of motorcycle bags and luggage including saddlebags, sissy bar bags, motorcycle rack and trunk bags, and tool bags so you can keep a unified look when customizing & accessorizing your motorcycle. Stylish and rugged storage for multiple Sport Bike fitments. Saddlemen's motorcycle panniers for sport bikes offer a semi-rigid construction that keeps its shape, for good looks, empty or full, easy mounting, and internal mesh pockets, zippered expansion and stylish 3-D accents. Weatherproof hard luggage with universal mounting. 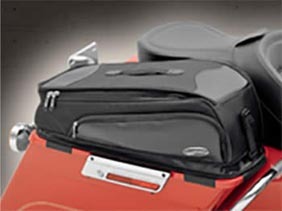 Saddlemen's Hard Case Luggage includes a universal mounting kit for attachment to existing luggage racks. Solid, reinforced and weatherproof, our matte black plastic construction looks at home on any bike, scooter or ATV. 44 liter portable security bag featuring Saddlemen's Steel Cage™ technology. Saddlemen's Destination Pack is a 44 liter portable security bag lined with a cut resistant stainless steel wire mesh cage interwoven between two soft, scratch free liners that provide weather and theft resistant storage for gear while on the road. 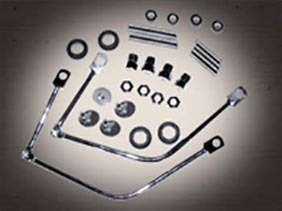 Saddlemen Quick-Disconnects Saddlebag Mounting Kits and components are designed to attach/detach all Saddlemen saddlebags and any rigid back aftermarket and OEM saddlebags with a simple twist of the quarter-turn locking fasteners. There is a serious lack of storage on a motorcycle; with the exception of a limited number of high end touring bikes, they do not come with bags, a trunk or glove compartment. Every motorcyclist needs a place to put stuff and very few bikes are equipped with bags from the dealer. Motorcyclists must look no farther than Saddlemen for the absolute best bags, trunks and saddlebags for their storage needs. The most popular and familiar method for adding a place for gear on a motorcycle is found in the traditional saddlebag; a direct descendant of the bags developed for horseback travel centuries ago. 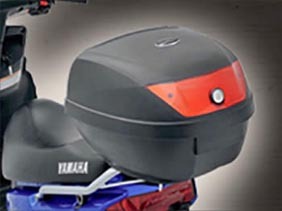 While saddlebags remain popular and stylish, especially with cruiser bikes, recent developments offer riders many more options for storage as well as substantial saddlebag improvements. Each type of bag has advantages and dis-advantages for a rider’s consideration as they decide which best meets their particular needs. Each bag type incorporates features that should be carefully considered as a bike is outfitted for that next ride to the local store or a 50 state tour. 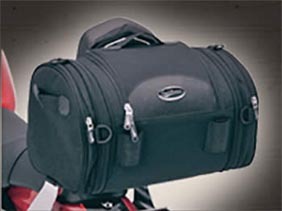 Saddlemen offers complete motorcycle luggage solutions; selections of bags and gear that work well together or separately to meet every rider’s needs. Deciding on the type of luggage to use is heavily influenced by the type of bike used and how the bike the bag is to be installed – on the tank, a rack, on a sissy bar or on the side like traditional saddlebags. The features and styling for cruisers, sport bikes, adventure bikes and scooters are very different. Each should be considered before a purchase decision is made – which best fits my bike, how is it mounted, what features are important? What else should I consider? Following is a guide that will make the selection of which bag to use much easier. Saddlemen offers luggage offering a broad range of options and styles to meet every rider’s needs and preferences. First, there are two installation or mounting concepts that should be understood; luggage can be either custom fit for your motorcycle or universal bags can be adapted to fit. A custom fit item is specifically designed for the exact measurements of your vehicle. No alterations are required. 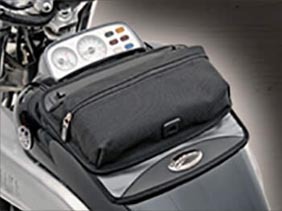 A universal fit bag or pouch is designed to be installed on most bikes, but will require adjustment or modifications to fit your motorcycle exactly. Universal bags tend to be lower cost, widely available and offer a broader range of styling and feature options, but may take increased installation effort. Specific fit bags tend to be more expensive and have less availability of styles and features but fit exactly. There is a serious lack of storage on a motorcycle; with the exception of a limited number of high end touring bikes, they do not come with bags, a trunk or glove compartment. Every motorcyclist needs a place to put stuff and very few bikes are equipped with bags from the dealer.